The Chesapeake Bay bisects Maryland, creating an Eastern Shore and a Western Shore dotted with hundreds of islands. The state boasts 31 miles of Atlantic Ocean coastline and the Potomac River winds along most of Maryland’s borders with Virginia and West Virginia. Other major rivers include the Patapsco, the Patuxent, and the Susquehanna. Maryland’s shoreline is almost 3,200 miles long and about one-fifth of the state (2,633 square miles) is covered by water. What is Maryland's maritime history? The maritime history of Maryland extends back thousands of years to when Native Americans living in the area used the waterways for transport, communication, food, and recreation like people do today. Four European explorers visited the area by ship during the period from 1498 to 1608 but it was not until 1634 that the first European settlers arrived. From that point in time, ships arrived with some frequency bringing colonists and commercial goods to sustain them. Maryland is traditionally a seafaring state and fishing, especially dredging for oysters, is one of its major industries. Historically, the Chesapeake has been of strategic importance to the U.S. Navy and home to the U.S. Naval Academy. Maryland’s waters are filled with prehistoric sites, wharves and other historic structures, and a range of sunken vessels including Native American dugout canoes, colonial merchantmen, warships, and modern shipwrecks. Sunken naval vessels include those of the U.S. and the Confederate States navies, state and foreign governments, privateers, and other agencies of the Federal Government. A few examples are described below. During the War of 1812, at least 18 naval vessels in the U.S. Chesapeake Bay Flotilla were intentionally abandoned and set afire in the Patuxent River by Revolutionary War hero Captain Joshua Barney to prevent capture by invading British forces. After winning the Battle of Bladensburg, British warships proceeded to Baltimore and commenced their bombardment of Fort McHenry. The British were unable to pass into Baltimore Harbor, however, and one of the reasons was that the Americans had scuttled ships there to make passage difficult. In 2004, some of the cannon balls from the Battle of Baltimore were dredged up in the harbor by the U.S. Army Corps of Engineers and provided to Maryland for public interpretation and display. At Mallows Bay along the Potomac River, at least 88 World War I era wooden steamships were intentionally sunk and, along with other derelict 18th and 19th century vessels, they form an artificial reef within Nanjemoy Natural Resource Management Area. In 1949, the German submarine U-1105 was sunk in the Potomac River near Piney Point as a result of high explosives tests by the U.S. Navy. The submarine was one of about ten built by the Germans during World War II that were outfitted with an experimental rubber sheathing designed to avoid detection by Allied sonar devices. At the close of the war, its captain surrendered and it was turned over to the U.S. Navy for study. Who takes care of Maryland's underwater archeological sites? The Maryland Historical Trust is responsible for identifying, studying, and preserving the state’s archeological heritage including prehistoric and historic sites in, partially in, or submerged beneath State waters. The Trust maintains a program for underwater archeology and employs a State Underwater Archeologist. Archeological heritage on submerged lands owned or controlled by Maryland remain the property of the state. Maryland and the U.S. Navy have an agreement governing the management of many sunken Navy vessels in Maryland waters. Sunken U.S. warships remain the property of the U.S. Navy, sunken confederate warships are under the jurisdiction of the General Services Administration, and sunken foreign warships, unless taken as a prize, remain the property of the foreign flag nation. A permit is not required to inspect, explore, photograph, measure, record, survey, or otherwise use and enjoy a submerged site as long as the site and its immediate environment are not disturbed. A permit is required from the Maryland Historical Trust for any excavation or disturbance of a submerged archeological site on state-owned or controlled submerged land. Other activities also may require a permit. Are there any underwater parks in Maryland? 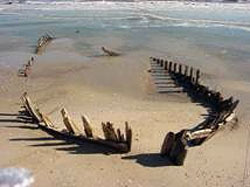 The U-1105 Shipwreck Preserve was established in 1995 by the State of Maryland in partnership with the U.S. Navy. An exhibit about the German submarine is housed at the Piney Point Lighthouse Museum. What laws concern underwater archeology in Maryland? The Maryland Submerged Archeological Historic Property Act is codified at §5A-333, et seq., in the Annotated Code of Maryland. Regulations for the Protection of Submerged Archeological Historic Property in Maryland can be found in Title 05, Subtitle 08, Chapter 03 of the Code of Maryland Regulations. The state laws stress that it is in the public interest to preserve the State's heritage and enrich present and future generations with the cultural, educational, inspirational, social, and economic benefits of the past.